In the seven years Virginia Eichhorn has been director and chief curator at the Tom Thomson Art Gallery in Owen Sound, Ont., thousands of works have crossed her desk in some form, purported to be by the great Canadian artist. She can count on one hand the number of works she thought were authentic. One of those crossed her desk this month. The sketch, an 18.5-by-24-centimetre oil on paperboard, depicts a large building in what appears to be an alpine setting. On the lower right corner, a signature: "Tom Thomson." A handwritten label on the back also states that the artist is Tom Thomson. The sketch in question depicts a large building in what appears to be an alpine setting, with a signature, ‘Tom Thomson,’ on the lower right-hand corner. For months, this sketch has been a preoccupation of Cameron Thomas's. Thomas, manager of estate contents for Ritchies in Toronto, has been working to authenticate the painting. This week, he finally acted on the information that's been gathered. The road to authentication comes with many twists and turns – mysteries uncovered, sometimes solved, often not. Many questions, some answers. There can be joy and vindication – or frustration and heartbreak. There may be no definitive answer, ever. Sometimes the level of confidence in a work's authenticity can only be measured in its eventual selling price. Last December, Thomas received a call about a painting from an art dealer based on the U.S. west coast. The dealer was working with an agent representing the owners of the sketch – part of a large collection from Europe. The dealer, with whom The Globe and Mail spoke at length but who asked not to be named, was seeking to authenticate the painting. The suggestion was that authentication would lead to a consignment either for auction or for private sale, Thomas explains. "This dealer of course thought if you're going to authenticate a Canadian painting, you'd better find a Canadian authenticator," he says. Thomas is new to this side of the art world. He knows how to sell a painting – but not how to authenticate it. The "Tom Thomson" sketch led to a crash course in Thomson's life and work, in authentication, Canadian art – and its power structure. Thomson, who grew up in Leith, near Owen Sound, Ont., died under mysterious circumstances at Canoe Lake in Algonquin Park in 1917. When a work purported to be by the artist emerges, there is often an air of mystery to the painting as well. This is no exception. Among the first questions the sketch raised was: How did this Thomson end up in Europe? "Paintings are as peripatetic as the people who own them," the dealer explains. "A Tom Thomson could appear in India or China, Morocco or Kansas. Because paintings travel. They travel like army ants; they just go where their owners go. I believe, going forward, as Tom Thomsons do appear, they'll appear in the most unlikely places." When asked why he contacted Thomas rather than one of the recognized Canadian Thomson scholars, the dealer said that he had read about a high-profile sale of a Thomson at Ritchies, called the auction house and connected with Thomas – who was friendly and eager, and with whom he felt he had an excellent rapport. Thomas sent the sketch to the Canadian Conservation Institute (CCI) in Ottawa – an agency of the Department of Canadian Heritage, which provides conservation expertise and services to Canadian museums, including scientific testing of historical art. In July, CCI delivered a report that Thomas interpreted as very positive: He said CCI reported that the dimensions and paperboard were consistent with what Thomson used during the first two years of his painting career – 1912 to 1914; that with one exception, the pigments used in the painting had been identified in other Thomson works; and there was no indication that the painting had been modified or retouched. There were no anachronistic elements or pigments identified that would rule out an attribution to Tom Thomson, it concluded. Bolstered by the findings, Thomas's next move was to have some of the country's top experts weigh in. Charles Hill, the retired long-time curator of Canadian Art at the National Gallery of Canada, saw the sketch on July 21 and pronounced that it was not a Thomson. Four days later, David Silcox, former president of Sotheby's Canada, viewed the sketch. He was less dismissive than Hill, but still skeptical. He said he needed time to consider it. (The Globe and Mail e-mailed Silcox about this, but did not receive a response.) Thomas's e-mails to another Thomson expert, Dennis Reid, were not answered. As it turns out, he had an incorrect address for Reid, and Reid never received the e-mails. Provenance was a concern for Hill, who referenced a couple of paintings by the Canadian modernist painter James Wilson Morrice from the same collection, which Hill called "atypical." He also noted that this sketch does not appear in Thomson's catalogue raisonné. Both Hill and Silcox were troubled with the alpine setting – the mountain in the background. Hill believed it was probably painted by an Italian in the Italian Alps. 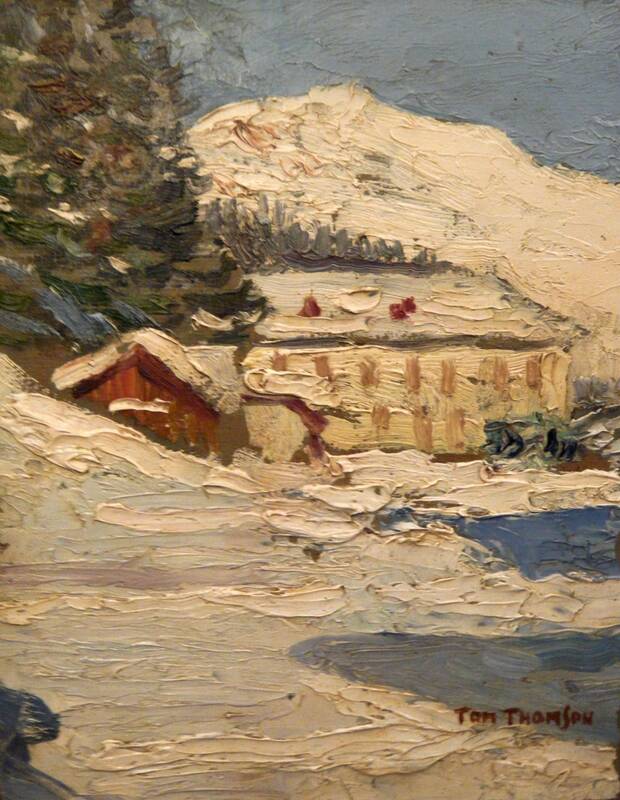 This became a major sticking point: Thomson did not paint in the alpine, so how could this sketch be a Thomson? Enter Tim Bouma. Bouma is the Leith-raised, Ottawa-based self-educated Thomson obsessive who runs the popular Twitter feed and blog, Tom Thomson's Last Spring. Bouma has remained anonymous in this endeavour, never revealing his identity publicly. But with the high stakes around this sketch, Bouma has decided to ditch the anonymity and work to prove the sketch authentic. Bouma is not an art expert, nor did he train as a historian. He works for the federal government as a senior policy analyst. But for years, Thomson has been a passion project, and then some. This is the kind of guy who, when in possession of a painting purported to be by Thomson, takes the long way back to Ottawa, going through Algonquin Park in a driving rainstorm, so the sketch can visit "home." The U.S. dealer found Bouma through his blog and thought he might be able to help. Bouma dove into the extra-curricular sleuthing project, volunteering his time. He went on to pinpoint the time of year, exact location and even the hour he believes the sketch was made – by Thomson, he's sure. Bouma identified the building in the sketch as Mowat Lodge on Canoe Lake in Algonquin Park immediately. But there were inconsistencies regarding the verandah and brick chimneys; he could see neither. The "blobs" on the roof, as he calls them, were in the wrong place to be those chimneys, he says. His research took him back to Mary I. Garland's recently published, comprehensive book Algonquin Park's Mowat: Little Town of Big Dreams. He found a 1912 photo of Mowat Lodge that he says shows no verandah and the absence of roof-peak chimneys. Boom. Bouma understood that there had been renovations to the building, but now he had dated photographic evidence. A 1915 photograph, also from Garland's book, shows Mowat Lodge from far shore across Canoe Lake – looking very much like the structure in the painting. And that photo shed new light on that "mountain" in the background. It was not a mountain at all, Bouma determined. The photo clearly shows a large hill behind Mowat Lodge. The hill would have been denuded of trees at the time; a clear cut, Bouma explains. Initially he thought the artist might have exaggerated the hill, but using maps and a series of calculations, Bouma determined that the "mountain" in the sketch had the right dimensions to be the elevation behind Mowat Lodge – about 40 to 50 metres above Canoe Lake. This was a eureka moment. "I said, 'Case is closed, this is it,'" says Bouma. Bouma believes the painting was made in 1914; the progression in painting style points to that spring. He believes Thomson travelled north on the train that arrived on Saturday April 25. He hypothesizes that Thomson painted the scene before the late spring snow and ice disappeared; he believes the blue patches in the foreground are thinning, melting ice, exposing the lake water underneath. The shadow suggests it was painted between 8 and 10 a.m., probably closer to 10. The weather forecast for that day was "partly fair," Bouma reports. He can just picture it: Thomson standing on the shore of Canoe Lake, looking westward, the sun on his back. But Garland herself disputes Bouma's findings. She says there was always a verandah on that building (and she can see them in the photo), chimneys were not added in a renovation, and further still, she says, the hill was not denuded of trees. "I do agree that the building in the painting looks like Mowat, but there are too many inconsistencies for it to actually be Mowat," she wrote in an e-mail to The Globe. "Furthermore, the hill, no matter how much foreshortening is involved, is just too high and too rocky to be a hill around Canoe Lake." Confident, Bouma (who had not yet heard from Garland about her concerns) took the sketch, and his theory, to the TOM in Owen Sound to get Eichhorn's opinion. "I have it right here on my desk," Eichhorn told The Globe that day, with Bouma in her office. "We took it for a little walk through our Tom Thomson collection and compared it with a number of paintings and I think it has the right flavour. The brush strokes look right to me, the style of the painting for that time period. I think it's quite credible." She also saw the CCI report. "Science doesn't lie. And again, that's just extra-firm confirmation that it fits the oeuvre." A Thomson authority, Eichhorn found the size and type of board to be consistent with Thomson. She also detected an influence in technique from A.Y. Jackson – they had shared a studio and Thomson had been learning from Jackson through the winter. Hugely encouraged, Bouma made an appointment to see Hill in Ottawa to have a second look. If the problem was the alpine issue, Bouma now had compelling evidence to suggest this was not an alpine scene at all. Hill listened to Bouma's theories and re-examined the painting this past Monday. "I have a lot of questions, but I'm interested in the arguments," Hill said afterward. He found the brushstroke of the tree in the upper left atypical and the weight of the board heavier than what Thomson was using in 1915. Still, choosing his words carefully, he said the sketch is of interest, but it raises a lot of questions. "I don't have a fixed opinion. I won't say it's not; I won't say it is." This was not the turn-around pronouncement Bouma, Thomas and the U.S. dealer had been hoping for. On Tuesday, Thomas at Ritchies pulled out. "This has been a long six-month process of investigation," he said. "I wanted to go into this with very little bias; I wanted to do as much research as possible to truly authenticate the painting. And after talking to Charlie Hill, after talking to David Silcox … there is a point where you just have to say, for the business, we've got to make a suggestion and that suggestion is that we've got to step away from this." Thomas walks away a bit disillusioned with the art authentication process, wishing there was a more formal system, such as a committee of identified experts to make determinations, such as the American Philatelic Expertizing Service provides for stamps. Bouma remains convinced – and committed. On Saturday, he is having the sketch delivered to the TOM. While the U.S. dealer continues to work on a sale, Eichhorn plans to install the sketch in September to coincide with a "Bring Tom Home" fundraising campaign to build a new facility and encourage owners of Thomsons to consider the TOM for their work. The TOM will explain the history – and mystery – behind the painting. The gallery will say they think there is a lot of good evidence that supports it being authentic. Visitors will likely be asked to weigh in: do they think this is a Thomson? Bouma absolutely does. "I'm more than sure. I think the evidence and everything will just stand for itself," he says. "I feel like all the pieces are there; what I've learned from this is there will always be a degree of uncertainty to this stuff." Editor's note: An earlier digital version of this story stated that Thomson expert Dennis Reid did not respond to Cameron Thomas's e-mails; however, Thomas had an incorrect e-mail address for Reid, and the latter never in fact received the e-mails. This version has been updated.